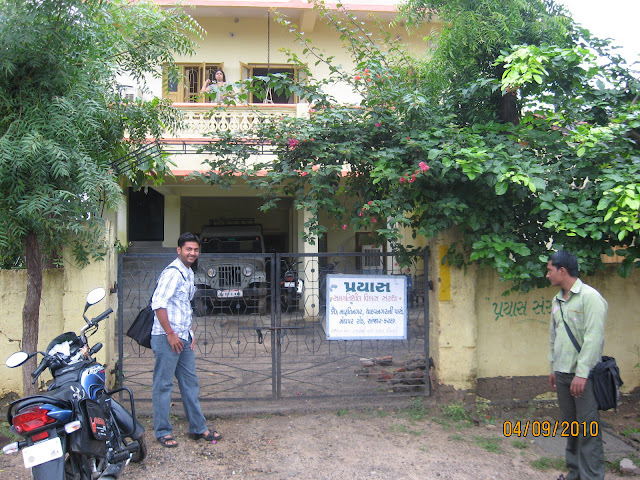 While I was in India, I visited Prayas, a microfinance institution (MFI) in Kutch located in the state of Gujarat in Western India. Gujarat has been recording some of the highest economic growth rates in India over the past two decades. 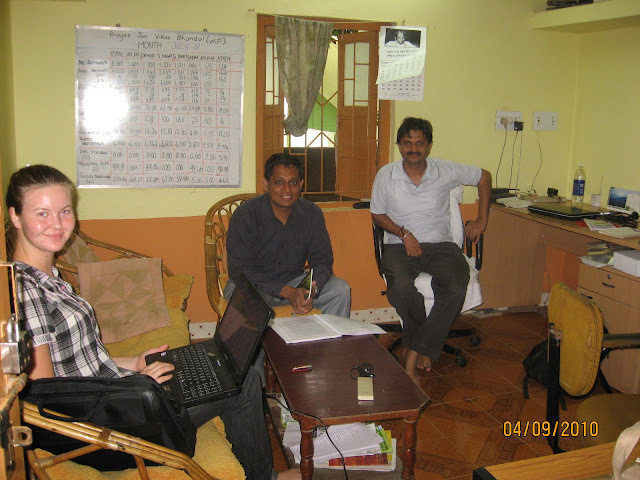 We are planning to sign up Prayas as the second microfinance partner. Prayas has built a fine reputation for its work and what caught my initial attention was that the Chairperson of their Board of Trustees is Ms. Jayshree Vyas who is the Managing Director of the famous Sewa Bank. Prayas was started by Bhadresh Rawal and Dilip Dave in 1997 with a focus on social empowerment of people. Their initial work was for Natural Resources Management – sun, water, vegetation and land as well as human rights and health awareness. Soon they realized that people wanted economic empowerment in a sustainable manner that is independent of the vagaries of the grant cycles of the government or funding agencies. So they added microfinance to their roster of activities in 2006. Since then they have lent to over 7000 borrowers and have also established relationships with 7 banks and development institutions. I was aware that Kutch is one of the poorest parts of Gujarat and is prone to natural disasters, such as the devastating earthquake in 2001 that left more than 12,000 people dead. But on my flight to Kandla from Mumbai, I still carried a nagging doubt at the back of mind whether we should support a MFI in Gujarat rather than one in a poorer state, where the entrepreneurs may need our more immediate attention. However, my doubts vanished when I visited Prayas and the entrepreneurs they support. 4:00 AM: Wake up. Make snacks to be sold in the shop. Cook food. Qasim goes to the market to get produce He also helps with filling water and the cooking. 7:00 AM: Qasim leaves to find work, Sakina Ben goes to the shop. 7:00 AM to 1:00 PM: In the shop. 1:00 PM to 3:00 PM: Lunch, cleaning and wash clothes. As we were talking with her, we were joined by one more lady, also called Sakina Ben. 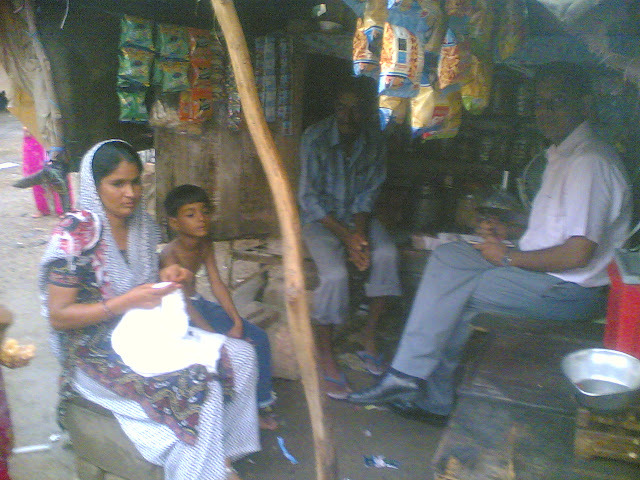 Sakina had also taken a microloan from Prayas. She has four children – three girls and one boy. She was very proud of her progress: “I have everything – a house, a TV, a DVD. Me and my husband cannot read and write, but we are determined to educate our children. My son goes to a private school while my daughters go to a government school”. Earlier she used to work as contract labor in a large textile factory. She would get paid Rs. 200 (USD 4.50) per day for eight hours work. Of the Rs. 200 she used to pay Rs. 10 for transportation and Rs. 20 to the labor contractor. The working conditions were tough. Apart from the 9 hours she spent at work, she had to walk one hour to reach her work unit in the factory premises (there was no internal transport from the factory gate to her work unit) and that left her with no time to take care of her children. As a result her eldest daughter stopped going to school to stay at home and take care of her siblings. But soon Sakina Ben realized that contract labor was going to earn her between Rs. 4000 and Rs. 5000 a month but will not necessarily make her and her family better off. 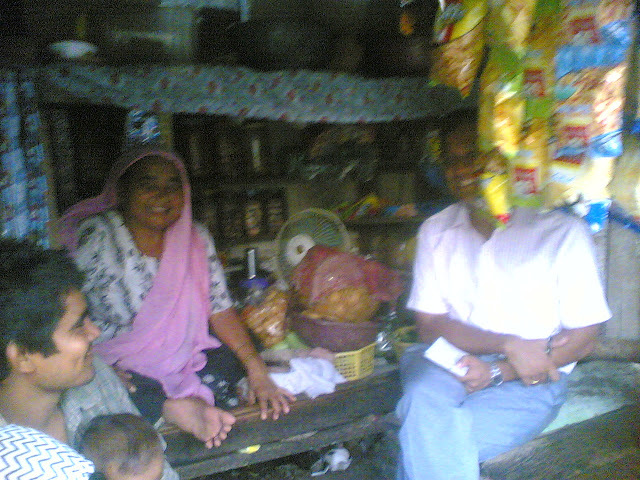 She then courageously quit her job and took a microloan from Prayas. She bought a cow with the microloan and also started doing embroidery at home. She now earns Rs. 4500 per month (USD 100) from her dairy and embroidery businesses. Her eldest daughter went back to school and Sakina Ben is able to give much more attention to her children. But such heroic stories have their poignant moments as well. One of her daughters lost three grades at school when they moved her from one school to another. The new school should have enrolled her in the 4th grade but they enrolled her in the 1st grade instead. It took three years for Sakina Ben to realize that her daughter had been enrolled in the wrong grade. I was aghast. “How could you let this happen?” I asked. “What could I do” said Sakina Ben, “we do not know to read and write and the child did not tell us anything”. Their resolve and the odds both the ladies had to overcome left a lasting impression. I realized that they need our help. I wanted to know more and was looking forward to the next day’s visit.